Our Frequency is 147.120+ with a 100Hz CTCSS Tone and a Plus 600kHz Off-Set. Our Repeater is located approximately 9 miles N.W. of Chambersburg, PA on top of Clarks Knob in the Tuscarora Mountains of Franklin County, PA. Our site packs 45 watts of power and has a cellwave antenna at 2200' above sea level. Our coverage area includes I-81 from roughly Harrisburg, PA to Harpers Ferry, WV. 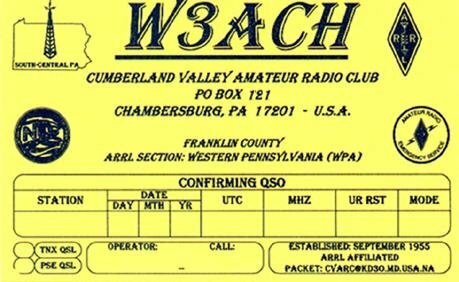 We also cover the Pennsylvania Turnpike (I-76) from Harrisburg, PA to Bedford, PA. Our repeater is opened to the general public and can be accessed 24 hours a day. The Exception is when we hold our "Sunday Night Net". Many of you may have noticed that from time to time when someone is using the repeater they "drop out" or part of a word does not come through. We have a DTMF filter active on the repeater controller. This is so when we transmit DTMF tones on the repeater they are not passed through. The filter is very sensitive and it seems that some peoples voices are just at the right frequency to activate the filter briefly.